Will Owls replace other birds in rock? But as long as these zoological specimens continue to craft music worth listening to, who am I to determine what they name their band? Friggin' awesome, right? From solo guitar to thundering toms and chorus of 'whu huh huh whoas' and then to Micah Middaugh's rough-hewn voice all by itself, there's such a wonderful push/pull/push dynamic going on in this song. And how great is the line "moustache covers my lower lip / no one can tell that I'm trembling"? How about the 'ooo-wah's' and cello(!) climax at the four-minute mark? I know I'm getting all rhetorical here, but I just can't imagine fans of folks like Evening Hymns or Ohbijou not taking immense pleasure in Breathe Owl Breathe's music. "Dogwalkers Of The New Age" brings Andréa Moreno-Beals' cello even more to the fore, and further reinforces my theory that there needs to be more cello in indie-rock in general. It's such a resonant and haunting instrument, while still capable of nimble moments - it's a five-tool four-string. The band is involved in a pretty interesting project, the result of which will be a hardbound book and 7-inch record. It's "listener supported" like an indie-PBS. Be sure to check out Breathe Owl Breathe's website and Myspace page. Two years on from The Express and three since their blazing debut, Turntable Soul Music, UK trio Belleruche have released 270 Stories (on the always-on-point Tru Thoughts). I had to go back and listen to the first two records after hearing 270 Stories for the first time because I wasn't quite sure it was the same band. Sonically, the trio have shifted a bit from a sound that their debut's title nailed on the head (with its warm soul vocals, turntablism and in-the-background guitar work) to something a little harder. Belleruche have run a piece of sandpaper across their smoothly polished sound leaving some gritty, rough patches. "3 Amp Fuse" and "Fuzz Face" (video below) are a far cry from Turntable Soul Music's "Minor Swing" or even The Express' "Anything You Want - Not That." There are still traces of the band they used to be ("Ginger Wine" and "Gold Rush" in particular) but the changes aren't so much a jarring transition as they are a measured progression for Belleruche. 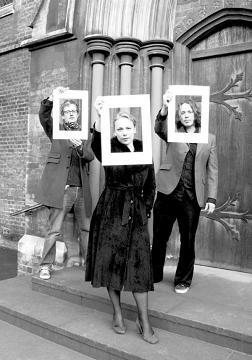 And while vocalist Kathrin deBoer has been the center of attention for the group, the new record finds guitarist Ricky Fabulous taking a larger share of the spotlight as so much of the album lives or dies by his work ("Cat In A Dog Suit" where he's all alone at the 2 minute mark, for one). It may take a couple listens, and a lessening of the attachment to their first two records, but Belleruche have recorded one of the best records I've heard this fall and I strongly encourage you to check it out. For now, check out the sweet new video for "Fuzz Face," made from over 4000 photocopies. Seriously. And here's a little something to satiate your ear appetite - an Asthmatic Astronaut remix of "You're Listening To The Worlds" from The Liberty EP, released prior to 270 Stories. And the link to a mix by DJ Modest for good measure. Don't forget to check out Belleruche's Myspace page and website.